Back in May last year I reviewed a novel by Peter Koevari, a promising new Indie author who has been creating an epic fantasy series known as Legends of Marithia. This is the second novel in that series and follows straight on from the events of the previous book - Legends of Marithia: Prophecies Awakening. After the climactic battle in the Elven Woods the two Marithian prophecies lie dangerously close to being swallowed by the darkness as Marithia suffers under the powers of the Blood Red Moon. Our hero Vartan, prophesied to save Marithia, lays comatose, broken and poisoned but sheltered under the protection of the mythical dragon while the evil Vampiress Kassina - prophesised to bring about Armageddon - has been returned to her Demon Lord Shindar. Castle Greenhaven lies in ruins following the clash with Kassina's forces and the Elves struggle to rebuild their once glorious city of Veldrenn. All is not lost however, if Talonsphere can be found before Shindar brings about the end of the world then there will hope for salvation and an end to the darkness. There we a few issues with the first book in this series; it had a feeling of being un-edited while the lack of characterisation was telling. It's great to see that all these concerns have been addressed in this second part, it reads much easier, with a more confident voice. There is a much more effective use of exposition - along with the occasional flashback, while the characters seem much more alive and reactive to situations around them. I loved the way that the author attempts to humanise the bad guys, it adds another depth to the novel and to be honest I can understand why Shindar turned bad and would have probably done the same thing in his shoes. This smoothing of the edges between good and evil, light and dark makes for a very interesting story, although to a certain extent the good guys do still come across as whiter than white. There is a much more even pace than the previous book, which is still pretty fast but gives the reader enough time to really digest and appreciate the story. All in all this is a huge improvement on the first novel which allows the reader to appreciate the authors' talent - that of creating a rich and vibrant story with an energetic pace and twisting plot. 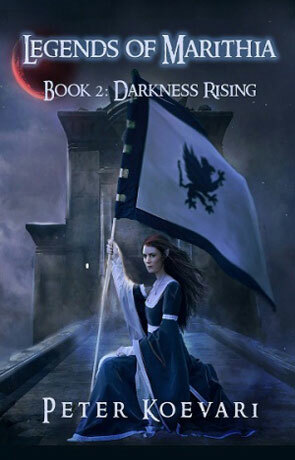 Darkness Rising is an accomplished novel by a talented author. Written on 11th January 2012 by Ant.